If you know your way around your computer’s user folders, and if you can hack a Lua file in a text editor like Notepad or TextEdit, you can certainly change the choices you see in Lightroom (for example see right). You can also change the HTML/CSS if you have those skills. It’s techy, which might deter some people, but it’s not too difficult…. The gallery templates are in C:\Program Files\Adobe\Adobe Lightroom\Shared\webengines\ (Windows) or an equivalent place on Mac – inside the app’s package. Copy the LR-Gallery-Standard.lrwebengine folder and temporarily put it on your desktop. Rename it LR-Gallery-Mine.lrwebengine. The drop down box is defined at line 274. If you’ve got this far, you’ll understand how to add extra choices. It’s just cut and paste, but take care with the syntax. That should be all the editing. So Web Galleries is a subfolder at the same level as Metadata Presets, Print Templates etc (if Web Galleries doesn’t exist, create it at that level), and put LR-Gallery-Mine.lrwebengine inside it. Restart Lightroom and “Grid Gallery – Mine” should be listed. That’s it! 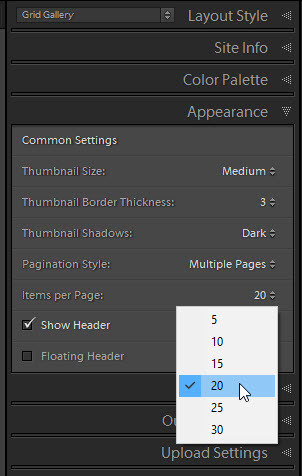 Sean McCormack’s article Anatomy of a Lightroom HTML Gallery is work reading. And for more technical information, see the Lightroom SDK. but I can’t change title and ID they not listed as it should be.